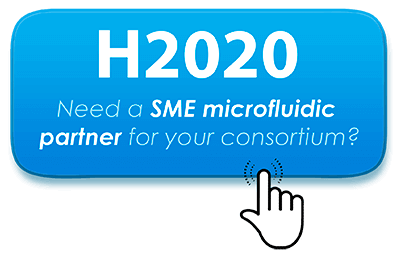 Elveflow>Microfluidics tutorials>Microfluidic reviews and tutorials>Fittings & Tubing Resources>Accessories Definitions>What does “23G fitted tubing” means ? 23G hypodermic needles and steel adapters are commonly used with tubings to inject or extract liquid samples. They are described by gauge numbers indicating outer diameters (OD). Among those values, the 23-gauge (23G) is a standard in both Medical and Microfluidic fields. 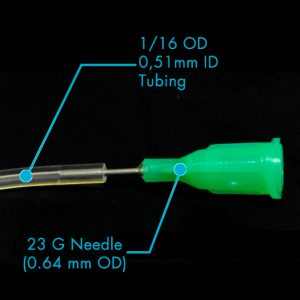 With a “23G fitted tubing” the sizes of tubing & needle fit, so that the 23G needle can be smoothly inserted into the 1/16″ microfluidic tubing. Elveflow provides 1/16″ OD Microfluidic Tygon tubing 23G fitted and 1/16″ OD Microfluidic PTFE Teflon tubing 23G fitted in the Microfluidic Accessories Shop.